Space fans should get their binoculars and telescopes dusted off for August. There will be lots to see with the aid of machine or the trusty naked eye. The gringa will share a cosmic calendar for the month ahead so everyone schedule their dinners and bedtimes accordingly if you want to enjoy some breathtaking galactic events rather than hunker down for digital entertainment indoors. August 2 – New Moon: Without the interference of moonlight this is the perfect night to explore other galaxies and nearby star clusters who will be shining in all their glory with no competition from our little satellite. 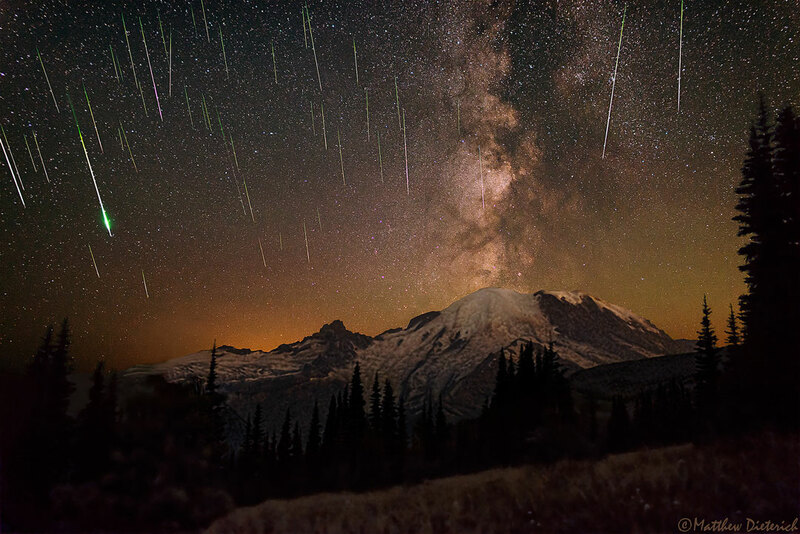 August 11,12 – Perseids Meteor Shower: At its peak, this little baby (pictured above) has the potential to create up to 60 meteors per hour (gives a whole new meaning to MPH). We can all thank comet Swift-Tuttle for this fantastic light show. Discovered in 1862. it has consistently provided entertainment for Earthlings through July and August. The event will peak on these two days in August. The best time to watch is right after the moon sets around midnight. Or, for those early to bed and early to rise, a pre-dawn show is also prime time for Perseids observation. August 16 – Mercury: This is the best time to view Mercury as it reaches it greatest eastern elongation from the Sun. Look for it in the evening sky at the highest point of the horizon or at a low point in the western sky just after sunset. August 18 – Full Moon: This is the best time to get a great look at our pockmarked neighbor. Full illumination will occur between 9-10pm UTC. A bit of full Moon trivia: some Native American tribes call the full Moon a Full Sturgeon Moon because these nights are the best times to catch this type of fish that populates the Great Lakes. Other tribes also called the full Moon the Green Corn Moon or the Grain Moon. August 27 – Venus & Jupiter: These two planets are going to join together in close proximity for a spectacular opportunity to see them both. Look for them in the western sky soon after sunset. They will be shining very brightly and close together. First of all, just take an up close and personal look at the pitiful pitted little thing. It has more impact craters than an eight-year-old ginger gringa had freckles. It seems pretty obvious to me that with global environmental disasters happening on a regular basis, it is very unlikely that life would flourish in such a place. Not to mention any surviving life having the opportunity to pursue advancements. Ceres, in many ways, is pretty much a clone of our desolate moon, an enormous rock with a lot of ice. With no evidence or traces of ever having vegetation, any ETs most assuredly would have starved to death. Unless, of course, it was a civilization that could survive on the nourishment of clay seasoned with ammonia and a splash of salt and iron. It’s highly unlikely that water as we Earthlings know it ever existed on Ceres. Although there is alot of ice, enough even to indicate the possibility of an ocean at one time, it wouldn’t have been a salty brine like we are accustomed to, inhabited with sharks and whales and penguins and such. It most likely would have been a caustic sea of ammonia and sulfuric acid. So, unless those ETs had skin of steel and enjoyed a dip in antifreeze, any recreational activities of a Ceres civilization would have been strictly limited to land-lubbing. If the gringa has sufficiently convinced you that no one was building pyramids on Ceres way back when, let us move on to the details that are still interesting despite lacking any ET spin. In the late 1700s Johann Elert Bode suspected a planet existed between Mars and Jupiter. However, the official discovery of Ceres is credited to Giuseppe Piazzi in 1801 who first claimed it was a comet. It was later classified as a planet but then redesignated as an asteroid in the 1850s. It seems scientists still haven’t made up their minds because it can be called any number of names when referred to by different people. The gringa doesn’t so much care. It makes no difference to me. Ceres is just Ceres, a planet named after the Roman goddess of agriculture despite the fact that not a single ear of corn or blade of grass has ever been grown on its surface. Over thousands of years meteors and comets have slammed into Ceres, creating hundreds of craters. A few of them are distinctly bright, containing either minerals with reflective properties or light reflecting off of ice. It is theorized that underneath the crusty and dusty surface of Ceres is a layer of water and ice that, by volume, is more than the fresh water found on Earth. This has led to scientists entertaining the notion that if living organisms once lived in the sea of Ceres, it is possible that through the many cosmic impacts throughout history some biological material may have been ejected into space and made its way to Earth. So, ETs on Ceres? The gringa thinks not. ETs from Ceres on Earth? It’s possible. Ceres is too dim to be seen with the naked eye except on extremely dark sky conditions. The best way to peek at Ceres is through a pair of binoculars or a telescope. The best time to see Ceres is fast approaching, from August through April. Observers in mid northern latitudes should look toward the low southern sky after nightfall. It is best to view on a night when the Moon is in waning stages. Look toward the Sagittarius constellation and Ceres will arc slowly westward and approach the border of the Capricorn constellation. If you have a fancy telescope you can enter coordinates and the telescope will do the hard work of locating and tracking for you. But if you only have binoculars, it is still easy enough to locate and track Ceres so don’t be discouraged. For some help in finding Ceres, online astronomy clubs are a great resource. The gringa wishes you the greatest success in taking a peek at Ceres! If you are an amateur stargazer who enjoys viewing interesting cosmic objects through a telescope, there are a few galactic peepshows you want to make sure you execute before the subjects disappear forever. Russia has announced their intention to test their intercontinental ballistic missiles (ICBMs) by blasting to smithereens certain near-earth objects (NEOs). The spacerocks in their crosshairs range in size from 20-50 meters (65-165 feet). Potential targets are asteroids as well as meteorites that have broken off from asteroids which orbit the Sun and are capable of surviving the atmospheric burn of falling to Earth, posing the risk of slamming into the surface of our planet. Russia’s target practice could serve to save lives which usually runs counter to the whole point of ICBMs. The first scheduled missile test is slated for 2036. That is when scientists expect asteroid 99942 Apophis to come within a dangerous close proximity to Earth. Although NASA has definitively ruled out the possibility of an impact, it is still expected to be a close enough encounter that Russia believes it will be within missile range. What weapons junkie could resist such an opportunity? However, these high grade shoot-en-anny toys require upgrades. It takes days to properly prepare the fuel the rockets use. That means that Russia’s current ICBM’s cannot be rapidly deployed to destroy a meteorite that Earthlings may only detect within hours of coming into range, such as the Chelyabinsk meteorite. It will take millions of dollars to make the necessary changes. However, when they are completed Russia’s weapons of war will be converted to defensive weapons keeping the entire world safe. Instead of Russia launching people killers, they will be launching people saving asteroid blasters. Does that mean that by means of defensive measures we all become Russian by proxy? Or perhaps that simply means for a brief moment, we all become one united human race? Either way, the gringa thinks the sentiment is sweet. Bottom line for backyard stargazers is that if you want to have a chance of seeing Apophis, you will get your last chance in about thirteen years. The asteroid was discovered twelve years ago and is a bit larger than three football fields. A pass of the asteroid is expected in 2029. This may be humanity’s last chance to view it before it’s 2036 pass that could be its final one if Russia gets its proposal approved and succeeds in blasting Apophis to infinity and beyond. Although the 2036 pass only has a one in a million chance of impacting Earth, it is still an historical event where astronomy is concerned. Apophis will be the largest asteroid that has ever come as close to Earth as it is projected to. It will zoom by almost 19,000 miles over the heads of unsuspecting Earthlings. Although there are other asteroid’s that pass closer, such as 2012 DA14 which does a 17,000 mile altitude flyby, Apophis is much, much larger than the nearer pipsqueaks. It is amazing how many NEOs travel by our home planet. Astronomy is a career where there is never a dull moment if you are entrusted with the task of tracking NEOs and projecting trajectories. This is a very important job to determine courses in order to protect all of humanity from the possibility of a collision. For kids intrigued with outer space and who don’t mind the math, astronomy offers the opportunity of a lifetime. To get a taste of the work they do, follow their reports on NASA’s Asteroid Watch program and stay current with updates through Twitter. 2004 Rosetta space probe launches for a ten year journey through space, chasing down a comet. 2014 Rosetta arrived and locked into a matching orbit with comet 67P, also known as Churyumov-Gerasimenko (which the gringa likes to refer to as Chur-Ger). Philae lander module touches down on the surface of the comet and begins collecting scientific data and transmitting back to Earth. Chur-Ger is not a comet. Chur-Ger is an object that has been sending signals received by NASA for over two decades. Illegally obtained digital images were forwarded alleging that artificial structures exist on the surface of Chur-Ger. Chur-Ger has an unusual movement pattern inconsistent with a trajectory or orbit of a natural celestial body. NASA has records indicating that Chur-Ger has changed its trajectory rather than have another space object causing it. Rosetta is not a comet chasing science mission but a cover-up for a joint NASA/ESA military style reconnaissance mission to discover just what the heck Chur-Ger really is. November 12, 2014, Philae successfully landed on the comet (a first time ever maneuver). May 27, 2016 the amino acid glycine was detected in the comet’s atmosphere. This amino acid is necessary for the construction of DNA and cell membranes. The building blocks of life were found on the comet which lends credence to the Anthropocene theory of how life began on Earth, life creating substances being delivered to Earth by hitchhiking on a comet or asteroid which collided with our planet. Glycine does not require water to form, solving the origins of life in outer space theory problem of no liquid water yet found on any celestial object other than Earth. Phosphorus was also detected which is necessary for DNA to form a framework and for cells to transport chemical energy. March 11, 2016 the ESA reports that there is an interesting magnetic-free bubble surrounding Chur-Ger’s nucleus and extending outward about 4,000 km. Basically, the comet is not magnetized. The de-magnetized properties results in the comet’s trajectory being affected in ways that are not typical for celestial objects. April 7, 2016 it was reported that Chur-Ger changed colors. Within the months after Rosetta’s arrival, Chur-Ger was very near the Sun. The heat from the Sun stripped away older surface materials and newer, brighter materials were exposed. Reflective properties changed. Chur-Ger changed from being a dark object to a brighter, bluer object. In all, the comet became about 34% brighter. April 26, 2016 Philae lander awakens and begins data collection but does not begin transmitting data until June 13. July 9, 2015 the Philae lander enters hibernation mode and discontinues data transmission. It is suspected that dust from Chur-Ger may be coating Philae’s solar panels, interfering with their ability to recharge. One reason that space agencies are willing to spend billions studying comets is that they are the best resources to find the origins of life. They have basically been frozen in time, the same today as they were billions of years ago. They are the perfect reservoirs to contain the primitive biological material that may have resulted in you and I today. Although the possibility of a secret mission involving communication with extra-terrestrials sounds exciting, the gringa is equally excited over the actual findings of the building blocks of life on a comet. To consider that humans are really the extra-terrestrials after all, that we all originated from somewhere in outer space, is utterly compelling. That means we are all truly the children of stardust or we have a home world somewhere which begs the questions of: A. Is it still inhabited? B. If not still inhabited, are there ruins and artifacts to be discovered that will shed light on who our ancient ancestors were? C. Have comets deposited life building blocks on other planets that have also evolved into intelligent life? So, although the whistle-blower suspects humans in communication with ETs on a comet, the gringa believes every human may already be communicating with ETs every day just by talking to each other! So, in essence, the Rosetta mission, in search of the origins of human life in outer space, is also on a search for extra-terrestrials like the whistle-blower claims. It’s really a search for ourselves, because the gringa suspects that we are not really from around here.